It was a surprise to me too. Unbeknownst (I love that word) to everyone I’ve spoken to, (meaning, nobody will admit to who did it) the cover for SYLO #2 has been released in cyber space. Oops. SYLO #1 hasn’t even been published yet! Ahhhhhh! Okay, I’m over it. So, here it is, with little (or no, actually) fanfare, build-up, or teasing, is the title and cover for the second book of The SYLO Chronicles. 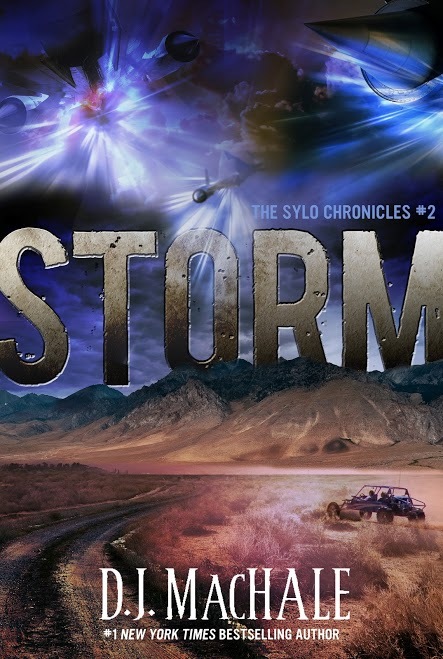 STORM will be published in March, so forget all about this and go read the first book…as soon as it comes out. Sheesh. This is a fun BuzzFeed article about my show Are You Afraid of the Dark? If you remember the show, you’ll get a kick out of these “behind the scenes” bits of info. Here’s a link to an interview I did for the Writing on the Sidewalk blog. Thanks Suzanne! I share a bit more stuff about the SYLO story in this video. Here’s the new SYLO book trailer. Let me know what you think. My publisher, Penguin, has a system where teachers can set up Skype sessions with their favorite Pendragon authors. If your teacher is interested in having one of us pay a visit (electronically), check this out.